(0 Customer Reviews) | Write Review 6 issues per year Need a new style bible fix? Download the latest edition of the Staffordshire Living now, offering you bucket loads of expert trend-setting advice all at the touch of a button. Staffordshire born and bred, our mission is to put our fabulous county back on the stylish map with inspiring and relevant editorial to suit only the most fun and fashion-forward tastes. know our top beauty picks? Check. Need some delicious recipes for a dinner party? Check. Or looking for your next holiday hot spot? Sit back as we have it covered. But that’s not all, being our counties leading bi-monthly we bring you all the top entertainment for the area, latest releases and forget Farmer Giles we source top celebs to interview. Who will it be this edition? Sections include Fashion, Health & Beauty, Wining & Dining, People & Places, Property & Interiors, Leisure, as well as a different exciting supplement each edition. Well here it is; our last edition of 2014, and where has the year gone? Our year has been packed full of fun occasions and events and to round of the year off nicely we celebrated our 10th Birthday and you know what they say about how time flies when you’re having fun! So how are we seeing off the year 2014? In style, naturally. 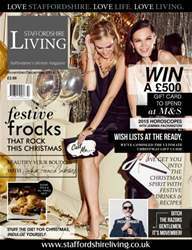 We’ve whipped up a cracking Christmas edition of Staffordshire Living with everything you could possibly need to know to get your festivities underway; from the ultimate gift guide which covers everyone from Dad to the dog, putting on the ultimate buffet spread and a few cheeky festive tipples we love (hick). We’ve played wilful guinea pigs with this year’s Christmas pamper presents and we’ve got some fabulous recommendations to spoil Mum with (or yourself). Need a new style bible fix? Download the latest edition of the Staffordshire Living now, offering you bucket loads of expert trend-setting advice all at the touch of a button. Staffordshire born and bred, our mission is to put our fabulous county back on the stylish map with inspiring and relevant editorial to suit only the most fun and fashion-forward tastes. You'll receive 6 issues during a 1 year Staffordshire Living magazine subscription. You'll receive 6 issues during a 1 year Staffordshire Living magazine print subscription.